With the help of local stakeholders and organizations including The Freshwater Trust and Drones Guanacaste, we mapped the corridor’s current vegetation, thermal uplift, land tenure and priority reforestation areas. In developing a strategy for restoration, El Centro Verde contributed lists of appropriate species and designed model plantings. A financial strategy was also included in the restoration plan, through which profits from our Bees for Trees program will be used to pay landowners an incentive for protecting and restoring riparian areas on their farm. Using a model akin to Costa Rica’s innovative Payments for Ecological Services regimes, we will now be able to drive the restoration of this critical corridor. With a better understanding of the corridor’s present state and direct experience modeling restoration of riparian areas, we are now equipped with an effective toolkit to renew the Nandamojo river’s main channel. 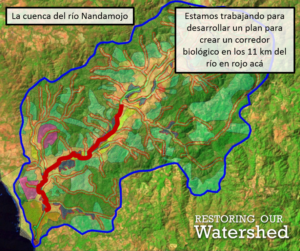 Achieving the restoration of this corridor will dramatically reduce the amount of water lost to evaporation, provide habitat for threatened wildlife species and help to filter out dangerous chemicals from runoff before they enter Nandamojo delicate estuary. ROW staff stand next to one of the riparian landowners and a tree planted in 2015, now over eight feet tall. 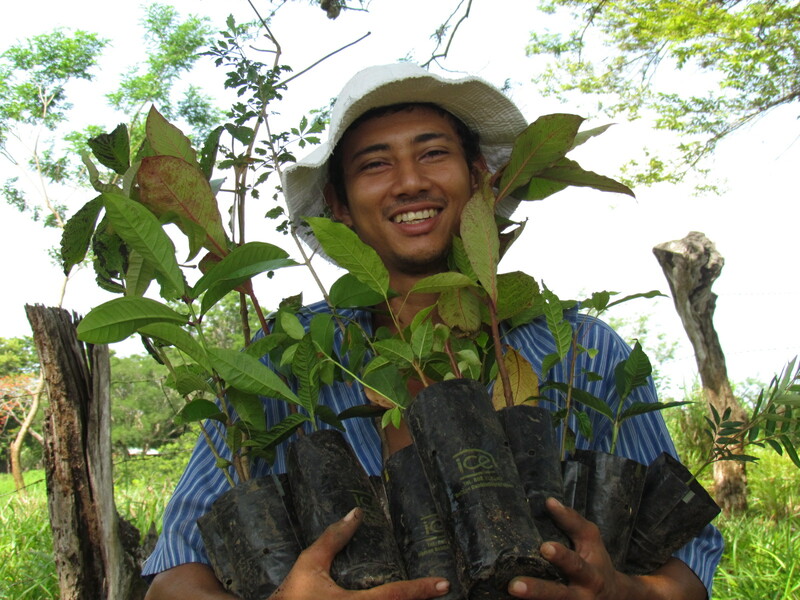 We have been delighted to visit the riparian areas already under reforestation. The farmers involved with the project have worked hard to take care of their saplings and many are now over eight feet tall. Within a couple short years they will be offering new shade to the Nandamojo’s main channel, limiting the water lost to evaporation and providing habitat for countless species of flora and fauna. We now have seven landowners participating in this program, which is funded by profits from our Bees for Trees program. They have fenced off a total of 7.75 acres (3.2 hectares) of the most critical riparian (riverside) areas in the watershed. The newest participant is an extremely important stakeholder. Their farm borders the Nandamojo’s precious estuary ecosystem and surrounds the river’s main channel for approximately a mile upstream. They’ve started by fencing off 2.25 acres closest to the estuary and we will be planting huge numbers of saplings there next year. A map of farms participating in our riparian corridor reforestation program, as of 2017.